St. Martha’s Hall has another opportunity to get your holiday shopping done while supporting the shelter! 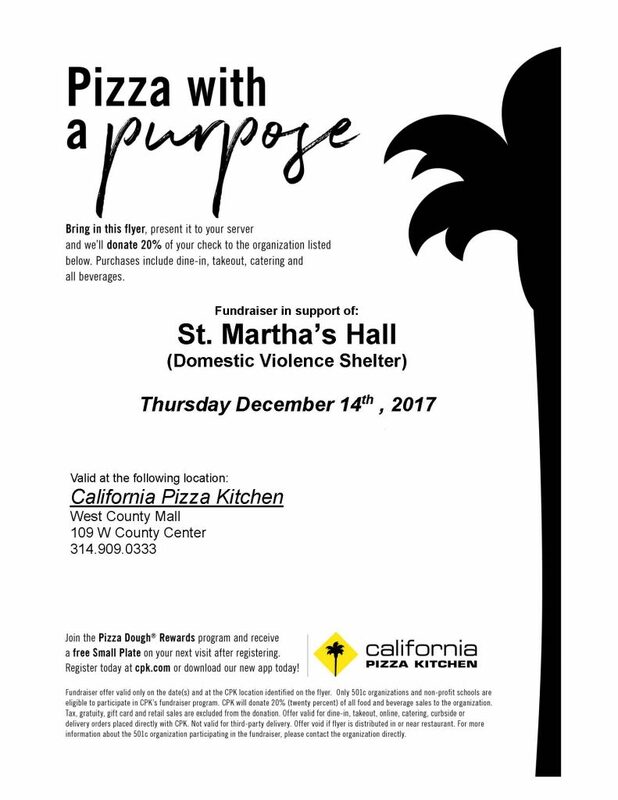 The California Pizza Kitchen location at West County Center (80 West County Center, Des Peres, MO 63131) will be giving back 20% of the proceeds from total bills all day on Thursday, December 14th, when you print or show the mobile version of the flyer below. Please join us! 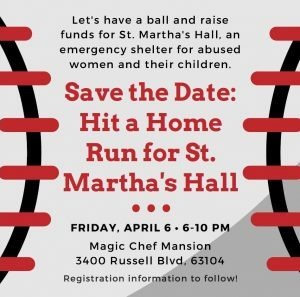 St. Martha’s Hall will not be offering the Time Out Against Domestic Violence Project this year with local high schools, in order to focus personnel and funding on our core shelter services. We will however be available to come talk at any high school or to any group about dating and domestic violence. Call 314-533-1313 to request a free speaker. Thanks for your past participation, the last three years have been phenomenal and inspiring. Garden Party and David in Clayton will be hosting another book fundraiser for the benefit of St. Martha’s Hall on Monday, December 4th. Wine and cheese will be served from 4:00pm-7:00pm. If you pre-order, your books will come signed by Mary Engelbreit. Pick up your book(s) on December 4th while you do some holiday shopping! 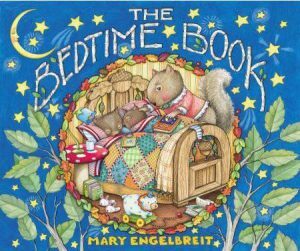 Mary Engelbreit’s The Bedtime Book pairs sleepy time poems, stories, and prayers with beautiful illustrations. 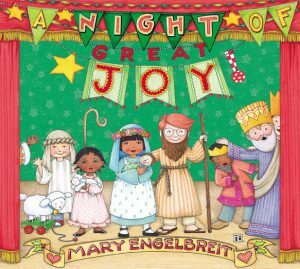 Also available is her book A Night of Great Joy, a delightful picture book that celebrates the joyful season of Christmas through the story of the nativity. You can pre-order your book(s) by calling 314-863-5944. They are $17.00 plus tax. You can pay over the phone and let them know how you want the book(s) signed. Mary Engelbreit will not be present at this year’s event, so please order in advance to pick up the signed book(s) on December 4th. There will be some books available for purchase that night that can be signed in time for Christmas and picked up at the store. Garden Party and David is in the heart of Clayton at 8103 Maryland Ave and offers beautiful floral arrangements, home décor, gifts for your whole Christmas list, and more! 100% of the profits from the book sales will go to St. Martha’s Hall to help us provide safe shelter, support, and services to abused women and their children. Throughout Domestic Violence Awareness Month in October, The Mary Kay Foundation℠ is awarding $20,000 grants to 150 domestic violence shelters across the United States, the District of Columbia, Puerto Rico and Guam for a total of $3 million. 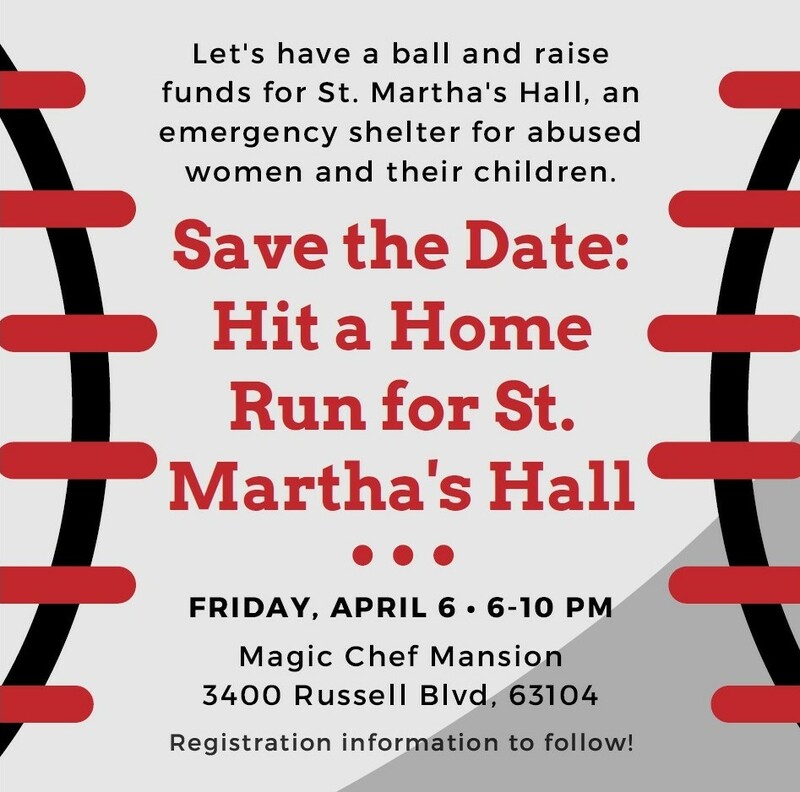 St. Martha’s Hall was chosen to receive one of the annual grants to further the organization’s efforts to combat domestic violence and provide three meals a day for our shelter residents. This year’s highly sought-after grant slate brings the total investment in The Foundation’s annual shelter grant program to nearly $42 million. St. Martha’s Hall will use the grant funding to help us partially cover the costs of three meals a day for our 24 residents each day. Other recipients use the unrestricted funds for basic operating expenses, hiring much-needed personnel, completing repairs and renovations or adding programs and resources based on the unique needs of their shelter and the clients they serve. At St. Martha’s Hall, we are incredibly grateful for support from The Mary Kay Foundation℠ and its continued commitment to break the cycle of domestic violence. Mary Kay Inc.’s global cause-related program, Beauty that Counts, helps support The Foundation’s annual shelter grant program. Applications for the 2018 shelter grant program will be available January 15 through April 30. Please visit marykayfoundation.org for additional information and for the full list of 2017 shelter grant recipients, click here . Ask and you shall receive. Since posting less than two months ago that the shelter was running low on breakfast cereal for residents, the community came through by donating over 300 boxes! Thank you to Casey & Devoti Law Firm, St. John Nepamuk, St. Monica Small Faith Group, LIFE (Living in Freedom Everyday), and family and friends of staff that gave cereal! This helps us keep our costs low and gives our residents a good start to the day, along with fresh fruit and milk which we purchase. St. Martha’s Hall now has an Amazon wish list! We will keep this updated regularly with the items we need. Please don’t forget to log into smile.amazon.com before you shop so that St. Martha’s can receive an additional monetary donation from your purchases. We also have a Target wish list if that is more convenient. Please call 314-533-1313 if you have any questions, and thanks for the support. It does take a lot of supplies to house 9 women and 15 children all year-round and your donations help us save thousands from having to purchase these supplies ourselves. Call 314-533-1313 to arrange a pick-up. Thanks for your support! 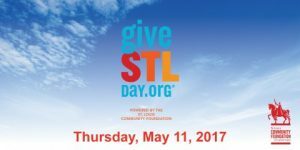 Thursday, May 11th is Give STL Day, a 24-hour, online giving event organized by the St. Louis Community Foundation to grow philanthropy in the St. Louis metropolitan area. The minimum donation is $10 and the maximum is $100,000. Prize money will be made available to amplify charitable donations. The goal is to inspire the community to come together for 24 hours to contribute as many charitable dollars as possible to support the work of local nonprofit organizations. The link to St. Martha’s Hall giving page is here. Last year we raised $2,318 in one day. Please help us reach our goal of $2,500 to support our 24-hour emergency shelter for battered women and their children. 100% of the donation qualifies as a charitable gift. You will immediately receive an email confirming the deduction from the St. Louis Community Foundation. 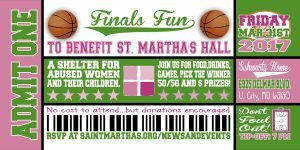 Join us for a Final Four (trademark of NCAA) themed fundraiser to benefit St. Martha’s Hall on Friday, March 31, 2017 from 7-10pm at 6925 Delmar Blvd., University City, MO 63130. There is no cost to attend the event, but donations are highly encouraged! It will include food, drinks, basketball games to watch and play, and several fun games for a chance at cash prizes. The funds from this event will help cover the costs of renovations at the shelter- new lighting, new flooring, and new paint. TO RSVP, CLICK HERE. For questions, call Katy at 314-533-1313. We hope to see you there! Thanks to Major Brands for your donations for this event!